My first Book Blogger Appreciation Week and I’m so excited! Looking through the BBAW archives late last fall helped me figure out Who was Who and What was What in the book blogging world before I started my book blog in January. Today’s topic on the 2011 BBAW Daily Topics is community and one of the samples for consideration was about the person who wrote the first comment. My first commenter was Heather from Based On A True Story…. who has a photo worthy of RIP VI on her blog today: The mask. Heather was very sweet and welcoming and actually excited about being the first to comment on my new blog. That made me so happy I printed it and posted it on my bulletin board. This is more in the nature of a tip, which is the topic for Wednesday, but since I’m talking about comments today, I’ll write it here: to get comments, make comments. Here’s what worked for me. I set a goal to make 1000 comments in 2011, which works out to about 85 per month. I surpassed my goal a month or so ago, but now I’m in the habit of keeping track, so I still aim to make sure I post 85 or more comments a month. 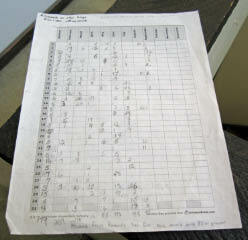 I keep track on a grid sheet that I printed from Kristen’s Guide. If you have ever thought that having the right worksheet would help you make a plan, or keep track of one, Kristen’s Guide probably has it ready to print, including this Blank One Year Grid Chart (pdf) that lets me track the number of comments each day for the whole year on one page. Happy Book Blogger Appreciation Week everyone! Yikes, Heather’s photo is R.I.P. worthy. I think I would have turned around and went home if that was following me to work. another selection of blogs that completely slipped past my radar, so thanks for the introduction. Wow, you are very organized! That’s an excellent idea to comment on several posts when you visit a blog. It certainly got my attention to see all of your comments this morning. Thanks!